Start from the ground up is an old saying but holds the key to successful organic practices. Soil is the foundation. It is the beginning and the end, the alpha and the omega, if not managed properly. Healthy soil is full of living things. Managing this living system and keeping it alive and well can make the difference between success and failure. 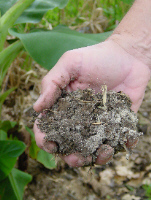 Understand soil formation and associated soil physical and chemical properties. List major soil chemical characteristics and their relationships to the environment and plant growth. Better understand factors that influence availability of plant essential nutrients. Name and briefly describe major groups of microbes common to soils. Understand the essential role of soil microbes in cycling of nutrient elements (e.g. nitrogen, phosphorus, and sulfur) through ecosystems. Develop a basic understanding of the importance of microbes in cleaning up contaminated soils.